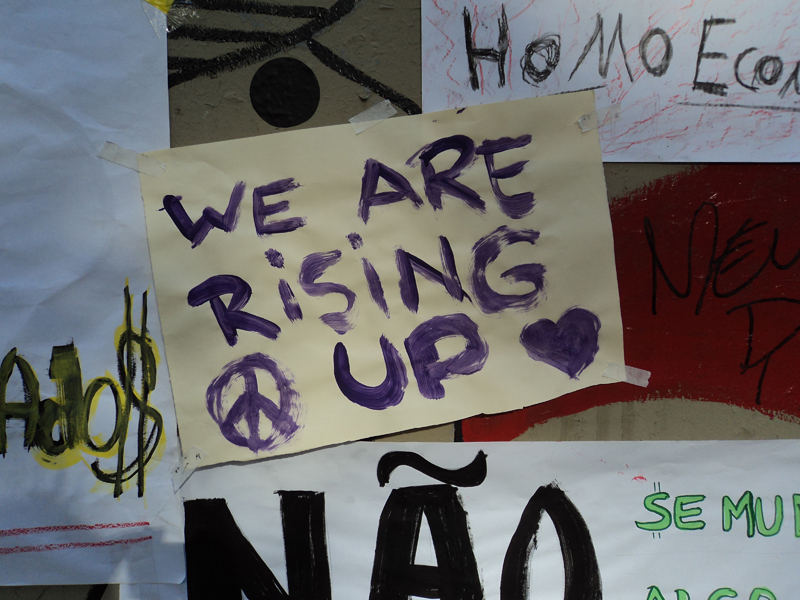 Coverage of the global Occupy movement by both journalists and academics has often treated the goals (or lack thereof) of protests in ideological terms, separate from its material environment. Yet to proclaim Occupy as an idea – as the OWS protesters did once evicted from Zuccotti park – stands in stark contrast to the emphasis on a physical, permanent presence and the creation of a space to create and legitimise alternative political and social systems. 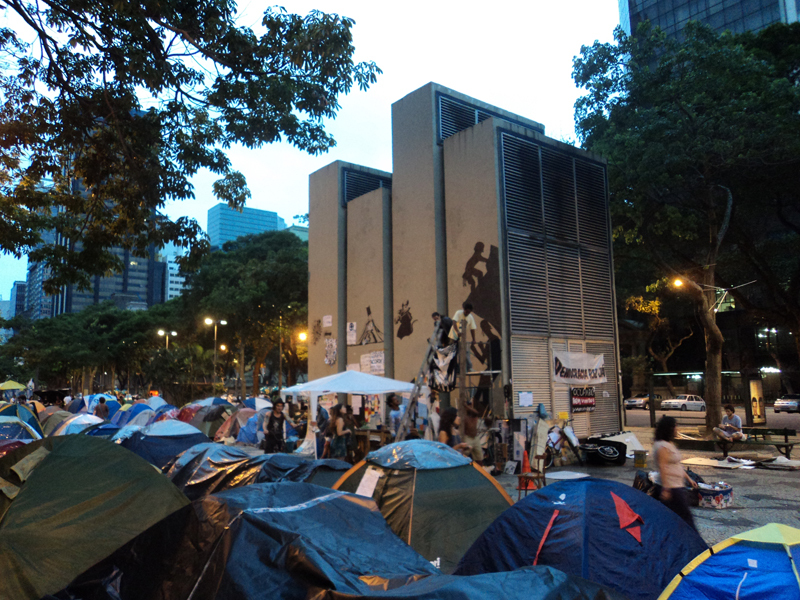 Ocupa Rio, a manifestation in the middle of Rio de Janeiro´s financial district, points both the importance and contradictions of material culture within the Occupy movement. In a booming economy with one of the highest levels of income disparity in the world, with a government investing billions into the upcoming 2014 FIFA World Cup and 2016 Olympics and `pacifying` favelas while maintaining an abysmal public education and health system, protesters here are not short of social causes. However, there is no easy consensus between the political discussions that take place in the plaza, those that develop online, and the material culture of protest as seen mostly through the posters, placards, painting and graffiti that until recently transformed the face of the Plaza Floriana. The posters in particular have offered a unique forum for debate as well as the opportunity for demonstrators to project their goals and ideals to passers-by. While the general assembly of the camp was increasingly regulated, meaning that many demonstrators felt excluded from debates, posters offered a more anarchic platform for expression as they were placed up, modified or defaced and torn down at will. In general, posters isolated specific causes for attention while within debates demonstrators would speak in more systemic terms, understanding certain events and institutions as symptomatic of the global capitalist system. At the same time, both avenues of expression grew gradually more esoteric after the first two weeks. In the case of discussions, phrases such as “political laboratory” or “a better world” replaced discussions over specific institutions or concepts, while the posters themselves became more abstract, featuring less writing and more pictures or illustrations. Furthermore, as the movement shrank and its existence was perceived as threatened, dialogue in the camp re-focussed on ideologically justifying the site´s existence and the right to re-claim public space; at the same time, paintings and graffiti as a more permanent impression on the site took over the walls of the plaza from posters, which were easily ripped or torn down. Image: This air vent for a nearby subway station was initially covered with posters, while after the third week they were taken down because of concerns of rain and instead of being replaced these paintings began appearing. At the same time, demonstrators would constantly photograph the site, including the general assembly, working groups, workshops and parties. 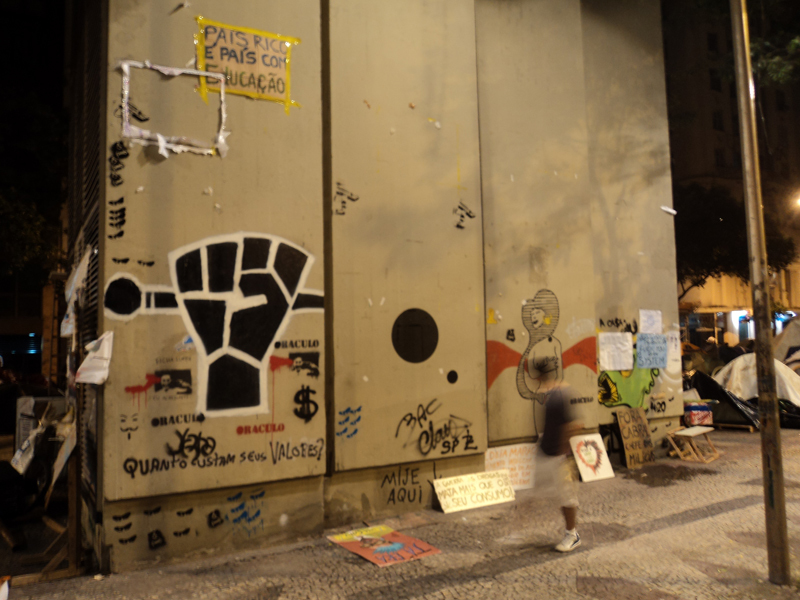 This documentation of Ocupa Rio also provided an important link between the physical space and the online arena in which photos and videos were constantly uploaded and discussed, not only from Rio but also from Occupy protests around the world. Increasingly students have been participating solely through ocupario.org and various Facebook sites; the constant feed of images from those who remain is thereby important in maintaining a sense of connectivity. Alternatively, many demonstrators in the camp saw those participating online as lacking commitment to the goals of the movement, and became resentful that executive decisions were being made outside of the plaza – particularly since many campers had no internet access themselves. Nevertheless, almost any action and object within the plaza, particularly posters, have been quickly uploaded and circulated more-or-less independently of how they evolved and changed inside the camp. Aside from these posters, the tents formed a symbolically important material presence on the site. While most protestors would come and go, spending perhaps a few hours on-site each day or only participating on weekends, these tents became a statement of permanence in contrast to the shifting composition of demonstrators. These were often left unoccupied for weeks at a time, particularly during the first month of the protest, until problems arose with the homeless in the plaza being accused of smoking crack in the abandoned tents. These tents were also arranged in two avenues, given addresses and their owners were registered by the security working group to keep track of their presence and help with thefts. Image: The primary avenue of tents was named `Love Street` (`Rua de Amor`) and tents were given addresses by the security working group. At the time this photo was taken (mid-November) most tents were unoccupied. The tents form an integral part of the image-consciousness of the group. Demonstrators were aware that the visual appearance of the site is crucial in projecting an ideological message to passers-by, particularly given that the protest has received very little coverage from mass media. However, the presence of tents was equally important for the activists themselves, constructing a sense of solidarity and morale; after the third week, as the numbers of tents slowly dwindled, they became for interviewees indicative of the decay and decline of the movement itself, even if these tents had been left abandoned for weeks beforehand. The similarities and contrasts between the material culture of Ocupa Rio and its often pointedly anti-materialistic rhetoric demonstrates that Occupy cannot be seen as a monolithic or unified movement, even within a single protest site. There is a complex and often conflictive relationship between the discourse of the camp, that which develops online, and the material discourse within the plaza, all of which evolve in tandem but are not merely reflections of one another. Instead, they represent diverging, occasionally contradictory, faces of a protest which is not simply an idea or an esoteric statement but is a diverse and constantly changing movement that exists in real time and space. At 5.30am on December 4 the municipal guards forcibly removed demonstrators from the plaza, holding some for the day until releasing them without charges and taking all objects, including tents, cameras, the entire communal library and personal documents, all of which protestors are still attempting to reclaim. The following day a meeting was held in the plaza to discuss the future of the movement, while at the same time council workers painted over the subway station vent, which had a number of works of street art done by a few campers. While one exclaimed that these workers were “ruining a work of art”, another demonstrator replied, “They´ll cover it over, but we´ll just paint it all again”.